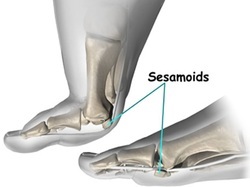 Sesamoids are small bones that are connected to tendons or are embedded in muscle. bottom of the forefoot near the big toe. Sesamoids give a smooth surface over which the tendons slide, as a result increasing the capacity of the tendons to transmit muscle forces. In the foot, sesamoids aid with weight-bearing and help elevate the bones of the big toe. Like other bones, sesamoids can fracture. In addition, the tendons surrounding the sesamoids an become irritated or inflamed which is called sesamoiditis. Sesamoiditis is a frequent condition among ballet dancers, runners and baseball catchers because of the pressures placed on their feet. Pain will be experienced under the big toe or on the ball of the foot, associated with swelling and bruising. There may be difficulty and pain in bending and straightening the big toe.